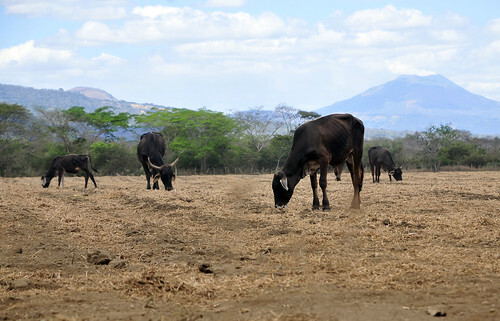 Cattle grazing field in Nicaragua. A new report from CGIAR warns that changes are needed in agriculture and food consumption around the world if future generations are to be adequately fed (photo credit: Neil Palmer/CIAT). A Commission on Sustainable Agriculture and Climate Change, which is an initiative of the CGIAR Research Program on Climate Change, Agriculture and Food Security (CCAFS), yesterday (28 Mar 2012) released its final report on ‘Achieving Food Security in the Face of Climate Change’ at the Planet Under Pressure Conference in London this week. ‘Major changes are needed in agriculture and food consumption around the world if future generations are to be adequately fed and farming must intensify sustainably, cut waste and reduce greenhouse gas emissions from farms. ‘”If you’re going to generate enough food both to address the poverty of a billion people not getting enough food, with another billion [in the global population] in 13 years’ time, you’ve got to massively increase agriculture,” said Sir John Beddington, the UK government’s chief scientific adviser, who chaired the commission. ‘Farming is probably responsible for about one-third of global greenhouse gas emissions, although the figure is hard to pin down as a large proportion comes from land clearance, for which emissions are notoriously difficult to measure. ‘Although there are regional variations, climate change is forecast to reduce crop yields overall—dramatically so in the case of South Asia, where studies suggest the wheat yield could halve in 50 years. ‘”We need to develop agriculture that is ‘climate smart’—generating more output without the accompanying greenhouse gas emissions, either via the basic techniques of farming or from ploughing up grassland or cutting down rainforest,”’ said Beddington. The economic and policy framework around food production and consumption need to change to encourage sustainability, to raise output while minimising environmental impacts. Read the whole article at BBC News: Farming needs ‘climate-smart’ revolution, says report, 28 March 2012. Tags: 2012PlanetUnderPressure, BBC, planet2012. Bookmark the permalink.